They not only stare at them, they eat them. Well, maybe not all trees, but woody browse in general. Hopefully, this penchant for woody invasives like Canada blackberry will make goats the perfect organic weed-whacker for protecting the grassy balds of the Roan Highlands. The Baa-tany Project is a volunteer-based project operating under a special use permit with the USDA Forest Service. The idea is to use goats – in this case angora goats – to help restore the grassy balds of Roan. The project covers about 79 acres between Jane Bald and Grassy Ridge. Partners for the project include USDA Forest Service, East Tennessee State University, Appalachian Trail Conservancy, Southern Appalachians Highlands Conservancy, US Fish & Wildlife Service, Friends of Roan Mountain, North Carolina Natural Heritage Program, Tennessee Division of Natural Areas, Tennessee Eastman Hiking & Canoeing Club, Wake Forest University, The Nature Conservancy and Appalachian State University. The origin of these balds, like many across the Southern Appalachians, remains a mystery. We know they were here to greet the first Europeans. John Fraser wrote about them in 1787 and Asa Gray, for whom the imperiled Gray’s lily is named, called them, in 1841, “the most beautiful east of the Rockies.” Besides Gray’s lily, there are at least 26 other species listed by the Federal government as, proposed, endangered, threatened or sensitive. Some scientists believe the balds are remnants of ancient grasslands that evolved during the Pleistocene (from 1.6 million to 10,000 years ago) and perpetuated by the natural conditions of the southern highlands. Others suggest that large herbivores like woolly mammoths may have helped create and sustain the balds and that their successors including bison and elk helped maintain the balds. Some researchers believe Native Americans may have burned the high peaks regularly, thinning and altering the soil so that trees could not grow. Others believe the balds are simply the natural evolutionary results of the physical environmental (climatic and edaphic factors) processes of the southern highlands. Whatever their origin, there is no doubt that balds have become an integral part of the environmental and cultural fabric of the Southern Appalachians. 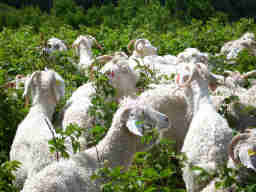 The Baa-tany Project marshaled and herded by Jamey Donaldson, botanist, consultant and adjunct curator of the John C. Warren Herbarium at East Tennessee State University, is a unique experiment integrating and involving the human psyche (through the herder and his goats) in a healing restorative process that may say as much about the environmental struggles of the human condition as it does about the environmental challenges of the high grasslands. To find out more about the Baa-tany Project go to http://friendsofroanmtn.org/goat%20project/goat%20project.html. And if you hurry you may even be able to join the Southern Appalachian Highlands Conservancy for a goat-viewing hike on Roan Mountain. Today is the last day to RSVP – so call 828.253.0095, ext. 205 or email Kristina@appalachian.org.